Jam-making has become a happy seasonal pursuit for me. Sadly, I don't foresee much preserving from our own fruit this year; both the apple and the plum trees have put out very little fruit. I think the apple tree has a grand total of six apples. It seems to be a bad year for fruit trees where I live. They just didn't flower well. Spring was cool and wet, which may have had something to do with it. 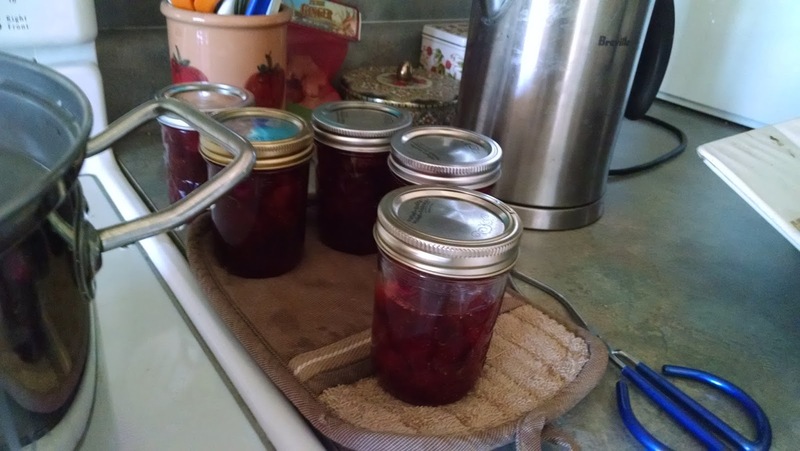 Last year, I made a huge amount of jam from our plums. I'd hoped to do it again this summer but it looks like I'll have to buy fruit for jam instead. This is really okay; I try for my bit of self-sufficiency but it doesn't always happen. I can't make a hen lay eggs when she's molting and I can't force plums from a tree in a bad growing season. Blood from turnips and all that. I was in the mood to make jam last weekend. We'd been to Costco, where the four-pound boxes of strawberries were looking really nice (and the price was right too), so strawberry jam seemed like the thing to do. At home, I decided to try something different by adding chopped, fresh tarragon to the fruit as it cooked. The result was deliciously different strawberry jam. The decision to use tarragon was not an arbitrary one. 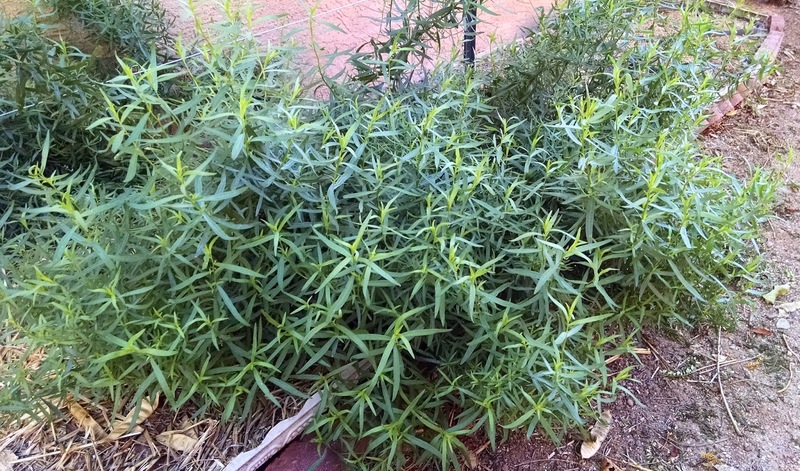 I have a huge amount of tarragon growing in the side yard at this time of year. It was planted by a previous owner of my house and it's remarkably hardy, coming back lushly year after year. 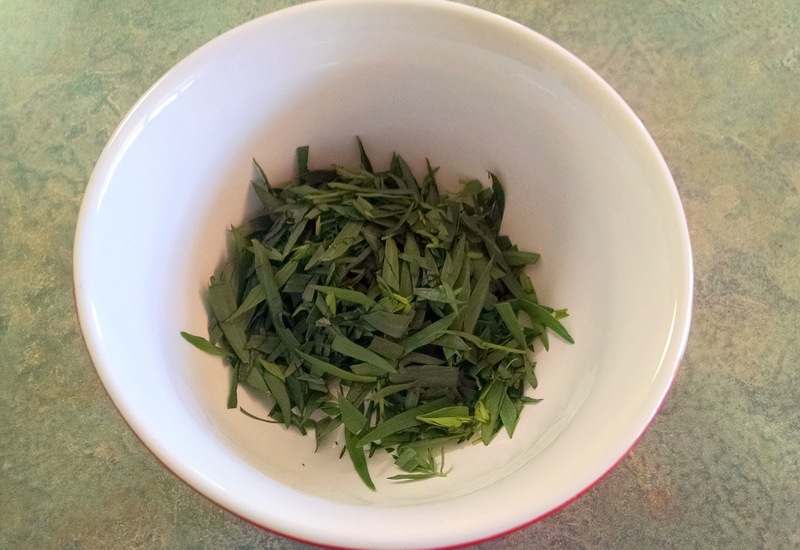 Tarragon, which has a mild licorice-like flavor, was a new experience for me and I set out to learn how to use in my cooking. I love tarragon in marinades and salad dressings, especially. I've even tried muddling it, like you would mint leaves, for an improvised alcoholic drink (it was interesting but not great). I've made a salad dressing with tarragon and pureed strawberries many times and really enjoyed it, so I thought it would be good in strawberry jam too. I cut a stalk about six inches long and stripped and chopped the leaves, for about 1/4 cup. 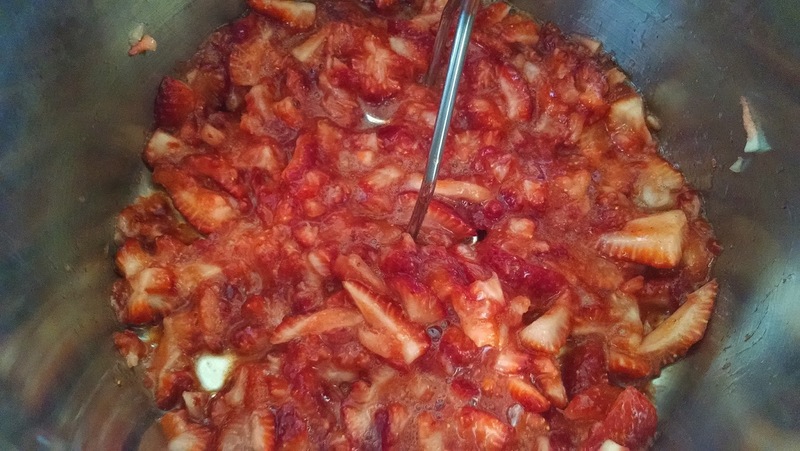 For a smallish batch of jam (about 5 half-pint jars), I used one and a half pounds of sliced strawberries and 3 cups of sugar, halving the amounts in a basic strawberry jam recipe, and cooked the fruit as normal. I stirred in the tarragon when the sugar had dissolved and the mixture was just coming to a boil. The tarragon cooked down to fine, wispy strands. The scent was wonderful. It's really good. The tarragon comes through, mildly herbal, without overpowering the strawberries. And you know how much I love my strawberries. Crush strawberries with a potato masher in a large pot. Stir in sugar all at once. 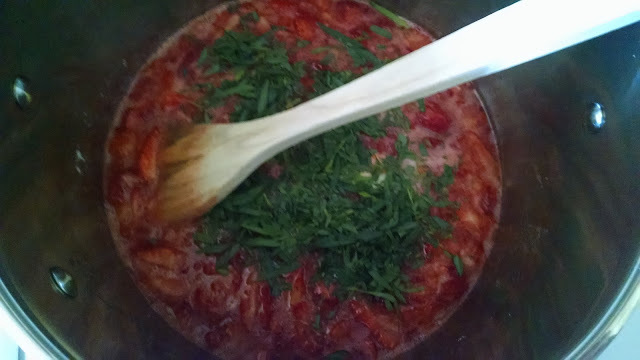 Cook over high heat until sugar has dissolved; stir in tarragon. Bring to a full rolling boil, stirring constantly. Stir in pectin, returning to a full rolling boil. Boil and stir for exactly 1 minute. Remove from heat and skim off any foam. 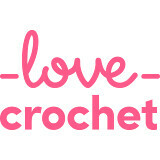 Ladle immediately into prepared jars, screwing on lids and rings tightly. Process as desired (I follow USDA guidelines for safe homemade jam). Mmmmm...that sounds delicious. I love jam making, we just opened our last jar of jam from last summer, and strawberry season is approaching very quickly....just in time :) I might have to find me some tarragon and give your recipe a go. Thanks for sharing. Have a wonderful weekend. What an interesting flavour combo. I will have to give it a try. 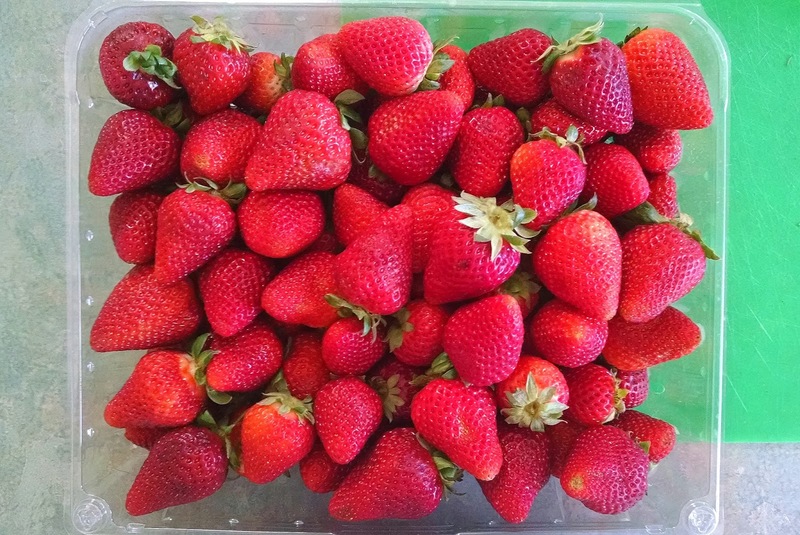 Usually we have pretty inexpensive strawberries from California during the spring but not this year. Ouch , coupled with our lower dollar they have been really expensive. I am hoping our local guys have a goiod crop this year. I have never tried jam with tarragon but I am willing to give it a go. The season has not started yet, we are a little behind due to the poor Spring weather. Have a great weekend. That sounds so good, especially right now! Those strawberries are amazing! I've never made jam, but if I do - will keep this in mind. Mmm, this looks delicious! 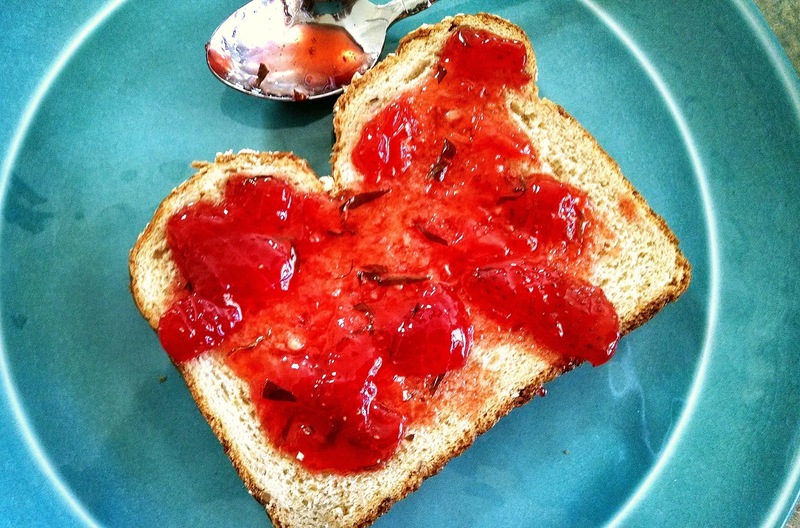 I love strawberry jam, and the added tarragon sounds amazing! Thanks for sharing the recipe, Jennifer. Wishing you a happy weekend. Your tarragon strawberry jam looks and sounds like the perfect infusion of sweet and herb-y! Congrats on your magazine feature; you must be elated! Crikey, your tarragon plant is huge!! Mmmm, I can almost smell your jam bubbling away. We finished the last jar of 2014 strawberry jam yesterday so my cupboard is ready and waiting to be re-stocked. I think I might try your recipe. My Victoria plum tree gave me the biggest crop ever last year (I think I made 14 jars of plum jam) and branches split with the weight of the fruit so I was expecting her to rest this year but to my surprise it looks like I will have a few dozen plums. I love making jam, for me it means summer is here! I've never used tarragon, but it sounds like something I would like. Your jam sounds wonderful! Now that is a combination I wouldn't have thought of, strawberry and tarragon !! Going to inform my dad ! He is a passionate jam-maker, strange isn't it, a man who likes making jam... But lucky for me, I always have homemade jam ! It looks delicious and the added tarragon sounds wonderful. I bet it doesn't last long. I love it when an experiment works out to be a success - great idea to use the tarragon. When the strawberries are cheap and plentiful I will give it a try. I love tarragon cooked with shallots in olive oil then added to creme fresh and white wine poured over chicken breasts. 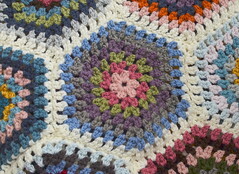 Thank you for your kind comment on my latest posts, I appreciate your visit. I too have just been making jam - very easy French Apricot Conserve and will show the recipe shortly. What an interesting combination, Jennifer! I never would have thought of combining the two flavours. Another way to use up excess tarragon (I used to have a huge patch of it in Kamloops) is to add it to steamed or roasted carrots. Tarragon and strawberries is a combination I've never thought of! But it looks good. I would like so much to taste it, new flavors are always tempting ... I have never made a jam, I have no experience at all. I'm sure your kids appreciate mum's gourmet food! I am not a fan of tarragon, but I bet I would love the plain strawberry jam! Hope you are enjoying the weekend! Oh my that looks so delicious! 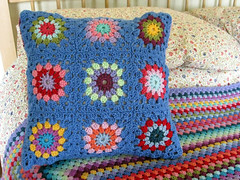 It looks delicious, I bet your house smelled fantastic when you were making it. 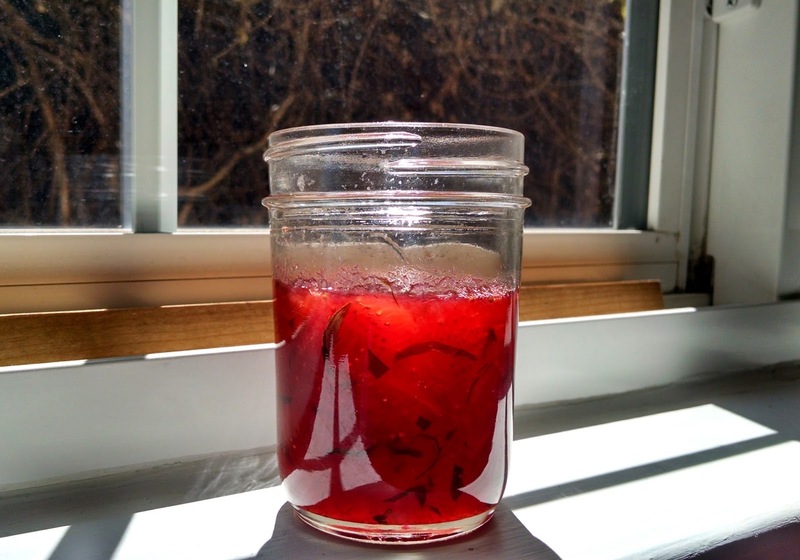 I'd Luke to try strawberry jam making this summer so will keep this recipe in mind. Thanks for your comment in my latest post. Cow parsley is Anthriscus Sylvester while the Queen Anne's Lace you have in America is Caucus carota. So they are two different plants though they're both related to the carrot. Have a lovely Sunday! That looks and sounds absolutely delicious. I love tarragon and never thought to pair it with strawberries! I May well try that. I have some tarragon growing away in the garden. It is very good with chicken. This. Looks. AMAZING! Thank you for sharing your recipe!!! Yum!! !